There are three different ways to boil an egg. Soft-cooked eggs have a runny yolk. The yolk for medium-cooked eggs is semirunny, and the yolk in hard-boiled eggs is completely cooked. No matter what method you use, the egg white, which should be completely cooked, will be firm. Cool the egg after you boil it. Sit the larger, rounded end of the boiled egg on a counter top or a table. Spin the egg on the hard surface, the same way you would with a top. A hard-boiled egg will spin evenly and swiftly since the yolk is solid. An egg with a semi-cooked or uncooked yolk won't spin quickly and will move in another direction instead of spinning in one spot. Depending on how you want to eat the egg, this will tell you if it's been cooked enough or needs to boil longer. You can sit the egg in an egg cup and slice off the top of it to check the yolk. However, once you do this, you can't boil the egg any longer since the shell has been removed. When you overcook an egg, the yolk takes on a purplish-green color. 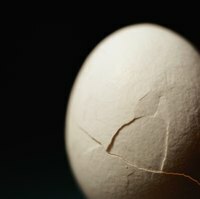 This happens because too much heat makes the egg's protein tough. Although commonly associated with breakfast, eggs can be prepared by boiling baking, scrambling, frying, poaching, and more. How Does a Hard Boiled Egg Differ From a Soft Boiled Egg?